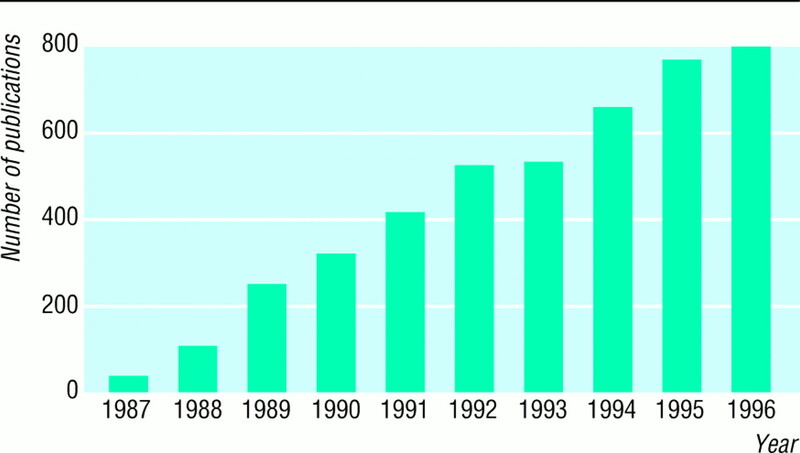 The number of papers published on meta-analyses in medical research has increased sharply in the past 10 years (fig 1). The merits and perils of the somewhat mysterious procedure of meta-analysis, however, continue to be debated in the medical community.1 23 What, then, is meta-analysis? A useful definition was given by Huque: “A statistical analysis that combines or integrates the results of several independent clinical trials considered by the analyst to be ‘combinable.’” 4 The terminology, however, is still debated, and expressions used concurrently include “overview,” “pooling,” and “quantitative synthesis.” We believe that the term meta-analysis should be used to describe the statistical integration of separate studies, whereas “systematic review” is most appropriate for denoting any review of a body of data that uses clearly defined methods and criteria (box). Systematic reviews can include meta-analyses, appraisals of single trials, and other sources of evidence.6 In this article we examine the potentials and promise of meta-analysis of randomised controlled trials. In later articles of this series we will consider the practical steps involved in meta-analysis,7 examine various extensions beyond the calculation of a combined estimate,8 address potential biases and discuss strategies to detect and minimise the influence of these in meta-analysis of randomised trials9 and of observational studies.10 We will conclude with a discussion of unresolved issues and future developments.11 Details of relevant software will appear on the BMJ's website at the end of the series. The first meta-analysis assessing the effect of a therapeutic intervention was published in 1955; interestingly, the treatment being evaluated was the placebo.13 A simple average was calculated of the effectiveness of placebos in such diverse conditions as postoperative wound pain, cough, and angina pectoris: the placebo was apparently effective in 35% of patients. The development of more sophisticated statistical techniques, however, took place in the social sciences, in particular in education research, in the 1970s. The term meta-analysis was coined in 1976 by the psychologist Glass.14 Meta-analysis was rediscovered by medical researchers to be used mainly in randomised clinical trial research, particularly in the fields of cardiovascular disease,15 oncology,16 and perinatal care.17 Meta-analysis of observational studies18 and “cross design synthesis” (the integration of observational data with the results from meta-analyses of randomised clinical trials19 20) have also been advocated. More recently, a network of clinicians, epidemiologists, and other health professionals has been set up. The Cochrane Collaboration (named after Archie Cochrane, a pioneer in the field of evaluation of medical interventions) aims to prepare, maintain and disseminate comprehensive and systematic reviews of the effects of health care.21 22 Since the foundation of the Cochrane Centre in Oxford in October 1992, this initiative has been growing rapidly, with the foundation of 15 further centres in Europe, North and Latin America, Africa, and Australia and hundreds of individuals from all over the globe collaborating in review groups. The unacceptable face of “statisticism”? Despite its widespread use, meta-analysis continues to be a controversial technique. While some exponents feel that meta-analysis should “replace traditional review articles of single topic issues whenever possible,”23 others think of it as a “a new bête noir,” which represents “the unacceptable face of statisticism” and “should be stifled at birth.” 24 This mixed reception is not surprising. The pooling of results from a particular set of studies may be inappropriate from a clinical point of view, producing a population “average” effect, while the clinician wants to know how to best treat his or her particular patient. Meta-analyses of the same issue may reach opposite conclusions, as shown by assessments of low molecular weight heparin in the prevention of perioperative thrombosis25 26 and of second line antirheumatic drugs in the treatment of rheumatoid arthritis.27 28 It is nevertheless clear that for maximum benefit to be obtained from prior research, sound reviewing strategies must become more accessible and highly valued. Traditional narrative reviews have several disadvantages that meta-analyses appear to overcome. The classic review is subjective and therefore prone to bias and error.29 Without guidance by formal rules, reviewers can disagree about issues as basic as what types of studies it is appropriate to include and how to balance the quantitative evidence they provide. Selective inclusion of studies that support the author's view is common: the frequency of citation of clinical trials is related to their outcome, with studies in line with the prevailing opinion being quoted more frequently than unsupportive studies.30 31 Once a set of studies has been assembled, a common way to review the results is to count the number of studies supporting various sides of an issue and to choose the view receiving the most votes. This procedure is clearly unsound, as it ignores sample size, effect size, and research design. It is thus hardly surprising that reviewers using traditional methods often reach opposite conclusions32 and miss small, but potentially important, differences.33 Clinical medicine is riddled with controversies, with reviews often being commissioned to end an argument. However, in controversial areas the conclusions drawn from a given body of evidence may be associated more with the specialty of the reviewer than with the available data.23 By integrating the actual evidence, meta-analysis allows a more objective appraisal, which can help to resolve uncertainties when the original research, classic reviews, and editorial comments disagree. The meta-analytic approach seems to be an attractive alternative to such a large, expensive, and logistically problematic study. Data from patients in trials evaluating the same or a similar drug in several smaller, but comparable, studies are considered. In this way the necessary number of patients may be reached, and relatively small effects can be detected or excluded with confidence. Meta-analysis can also contribute to considerations about the generalisability of study results. The findings of a particular study may be valid only for a population of patients with the same characteristics as those investigated in the trial. If many trials exist in different groups of patients, with similar results in the various trials, then it can be concluded that the effect of the intervention under study has some generality. By putting together all available data, meta-analyses are also better placed than individual trials to answer questions about whether an overall study result varies among subgroups—for example, among men and women, older and younger patients, or subjects with different degrees of severity of disease. As discussed later in this series,8 these questions can be addressed in the analysis and often lead to insights beyond what is provided by the calculation of a single combined effect estimate. One benefit of meta-analysis is that it renders an important part of the review process transparent. In traditional narrative reviews it is often not clear how the conclusions follow from the data examined. In an adequately presented meta-analysis readers should be able to replicate the quantitative component of the argument. To facilitate this, it is valuable if the data included in meta-analyses are either presented in full or made available to interested readers by the authors. The increased openness required by meta-analysis leads to the replacement of unhelpful descriptors such as “no relation,” “some evidence of a trend,” “a weak relation,” and “a strong relation,” with reproducible numerical values.40 Furthermore, performing a meta-analysis may lead to reviewers moving beyond the conclusions that authors present in the abstract of papers, to a thorough examination of the actual data. As research assistants cannot be sent away with file cards to return with abridged conclusions, Rosenthal has suggested that this will lead to a “decrease in the splendid detachment of the full professor”40—in other words to a stronger involvement of the reviewers in the individual study results. As meta-analysis becomes a standard procedure, however, the splendid detachment may soon be restored. Cumulative meta-analysis is defined as the repeated performance of meta-analysis whenever a new trial becomes available for inclusion. Such cumulative meta-analysis can retrospectively identify the point in time when a treatment effect first reached conventional levels of significance. For example, Lau and colleagues showed that for the trials of intravenous streptokinase in acute myocardial infarction, a significant (P=0.01) combined difference in total mortality had been achieved by 197341 (fig 2). At that time, 2432 patients had been randomised in eight small trials. The results of the subsequent 25 studies, which included the large GISSI-1 and ISIS-2 trials42 43 and enrolled a total of 34 542 additional patients, reduced the significance level to P=0.001 in 1979, P=0.0001 in 1986, and to P<0.00001 when the first very large trial appeared, narrowing the confidence intervals around an essentially unchanged estimate of about 20% reduction in the risk of death. Interestingly, at least one country licensed streptokinase for use in myocardial infarction before GISSI-142 was published, whereas many national authorities waited for this trial to appear, and some waited a further two years for the results of ISIS-243 (fig 2). A similar picture is apparent in the case of ß blockade in secondary prevention of myocardial infarction. In 1981 an influential editorial stated that “despite claims that they reduce arrhythmias, cardiac work, and infarct size, we still have no clear evidence that ß blockers improve long-term survival after infarction despite almost 20 years of clinical trials.” 44 Retrospective cumulative meta-analysis, however, shows that a significant beneficial effect (P=0.02) was evident by 1977, and that the combined effect estimate was already both clinically important and highly significant (odds ratio 0.71 (95% confidence interval 0.59 to 0.84), P=0.0001) in 1981 (fig 3). Subsequent trials in a further 13 113 patients only confirmed this result. Another application of cumulative meta-analysis has been to correlate the accruing evidence with the recommendations made by experts in review articles and textbooks. Antman and colleagues showed for thrombolytic drugs that recommendations for routine use first appeared in 1987, 14 years after a significant (P=0.01) beneficial effect became evident in cumulative meta-analysis.45 Conversely, the prophylactic use of lidocaine continued to be recommended for routine use in myocardial infarction despite the lack of evidence for any beneficial effect and the possibility of a harmful effect being evident in the meta-analysis. These examples have been taken to suggest that further studies in large numbers of patients may be at best superfluous and costly, if not unethical,46 once a significant treatment effect is evident from meta-analysis of the existing smaller trials. There are several other examples, however, of meta-analyses showing benefit of statistical significance and clinical importance that were later contradicted by large randomised trials.47 Meta-analysis clearly has advantages over conventional narrative reviews and carries considerable promise as a tool in clinical research and health technology assessment. Meta-analysis is not an infallible tool, however, as will be discussed later in this series. We thank Dr T Johansson and G Enocksson (Pharmacia, Stockholm) and Drs A Schirmer and M Thimme (Behring, Marburg) for providing data on licensing of streptokinase in different countries. The department of social medicine at the University of Bristol is part of the Medical Research Council's health services research collaboration. Funding: ME was supported by the Swiss National Science Foundation. .Meta-analysis and the meta-epidemiology of clinical research.BMJ 1997;315: 617–9. .The promise and problems of meta-analysis [editorial].N Engl J Med 1997;337: 559–61. Meta-analysis under scrutiny [editorial].Lancet 1997;350: 675. .Experiences with meta-analysis in NDA submissions.Proceedings of the Biopharmaceutical Section of the American Statistical Association 1988;2: 28–33. 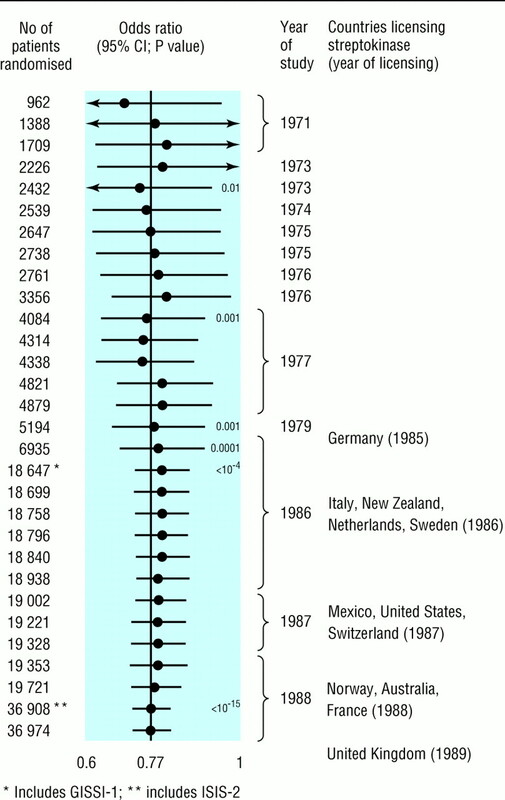 .Meta-analysis: state-of-the-science.Epidemiol Rev 1992;14: 154–76. .Foreword. In:Chalmers I, Altman DG, eds. Systematic reviews. London: BMJ Publishing,1995. .Meta-analysis: principles and procedures.BMJ 1997 (in press). .Meta-analysis: beyond the grand mean?BMJ 1997 (in press). .Meta-analysis: bias in location and selection of studies.BMJ 1997 (in press). .Meta-analysis: spurious precision? Meta-analysis of observational studies.BMJ 1997 (in press). .Meta-analysis: unresolved issues and future developments.BMJ 1997 (in press). .Report on certain enteric fever inoculation statistics.BMJ 1904;3: 1243–6. .The powerful placebo.JAMA 1955;159: 1602–6. .Primary, secondary and meta-analysis of research.Educ Res 1976;5: 3–8. Effects of adjuvant tamoxifen and of cytotoxic therapy on mortality in early breast cancer. An overview of 61 randomized trials among 28,896 women.N Engl J Med 1988;319: 1681–92. .Effective care during pregnancy and childbirth. Oxford: Oxford University Press,1989. .Quantitative methods in the review of epidemiologic literature.Epidemiologic Reviews 1987;9: 1–30. .Cross design synthesis: a new strategy for medical effectiveness research. Washington D.C.: G.O.A. 1992. Cross design synthesis: a new strategy for studying medical outcomes [editorial]?Lancet 1992;340: 944–6. .The Cochrane Collaboration. Preparing, maintaining, and disseminating systematic reviews of the effects of health care.JAMA 1995;274: 1935–8. .Minimizing the three stages of publication bias.JAMA 1990;263: 1392–5. .Statistical inference: a commmentary for the social and behavioural sciences. Chichester: Wiley,1986. .Low-molecular-weight heparin versus standard heparin in general and orthopaedic surgery: a meta-analysis.Lancet 1992;340: 152–6. .Low molecular weight heparin in prevention of perioperative thrombosis.BMJ 1992;305: 913–20. .The comparative efficacy and toxicity of second-line drugs in rheumatoid arthritis.Arthritis Rheum 1990;33: 1449–61. .Meta-analysis of second-line antirheumatic drugs: sample size bias and uncertain benefit.J Clin Epidemiol 1992;45: 587–94. .Meta-analysis: whither narrative review?Pharmacotherapy 1989;9: 274–84. .The medical review article: state of the science.Ann Intern Med 1987;106: 485–8. .Statistical versus traditional procedures for summarising research findings.Psychol Bull 1980;87: 442–9. .The importance of beta, the type II error, and sample size in the design and interpretation of the randomized controlled trial. In:Bailar JC, Mosteller F, eds. Medical uses of statistics. Boston, MA: NEJM Books,1992:357. .Cholesterol and total mortality: need for larger trials.BMJ 1992;304: 1689. .Meta-analysis in medicine. Where we are and where we want to go.J Clin Epidemiol 1989;42: 35–44. 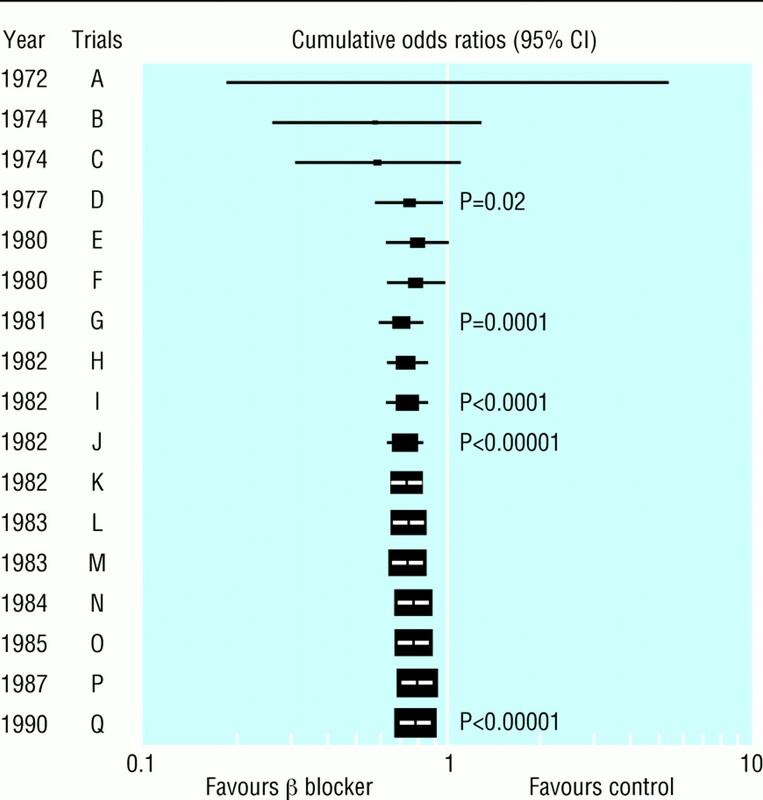 .Interpretation of results from subset analyses within overviews of randomized clinical trials.Stat Med 1987;6: 371–8. .Randomised controlled trials of fetal monitoring 1973-1977. In:Thalhammer O, Baumgarten K, Pollak A, eds. Perinatal medicine. Stuttgart: Thieme,1979:260. .The Dublin randomised controlled trial of intrapartum fetal heart rate monitoring.Am J Obstet Gynecol 1985;152: 524–39. .An evaluation of procedures and results. In:Wachter KW, Straf ML, eds. The future of meta-analysis. New York: Russel Sage Foundation, 1990:123. .Cumulative meta-analysis of therapeutic trials for myocardial infarction.N Engl J Med 1992;327: 248–54. .Effectiveness of intravenous thrombolytic treatment in acute myocardial infarction.Lancet 1986;397–402. .Randomised trial of intravenous streptokinase, oral aspirin, both, or neither among 17,187 cases of suspected acute myocardial infarction: ISIS-2.Lancet 1988;ii: 349–60. .Timolol after myocardial infarction: an answer or a new set of questions?BMJ 1981;282: 1565–70. .A comparison of results of meta-analyses of randomized control trials and recommendations of clinical experts.JAMA 1992;268: 240–8. .Setting limits in clinical medicine.Arch Intern Med 1994;154: 505–12. .Bias in meta-analysis detected by a simple, graphical test.BMJ 1997;315: 629–34.